May is another 5 Saturday month and so once more we have a treat for you. We are lucky enough to have Rebecca (Melly Moo) to join us this week. She contributes regularly to our challenges and I know that you are all inspired by her fabulous work. Here's what the team has come up with! 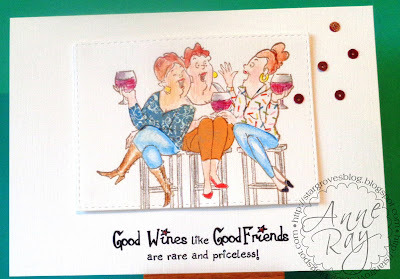 Details of how Rebecca made this are on her blog, do pop over and pay her a friendly visit! My two legs are busy getting legless! I've coloured a favourite Art Impressions stamp with watercolour pencils on textured card, with some added paper piecing. The sentiment is a Katy Sue Wine Buffs stamp. When I was assembling my card I got a mark on the image - tiny wine coloured sequins came to the rescue! The stamping on this is in fact deep brown, but looks almost black in this picture. 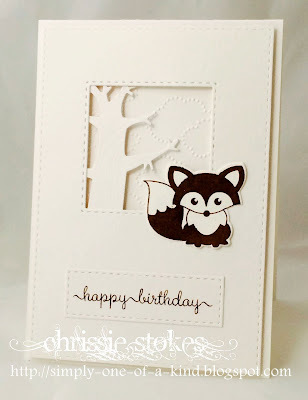 The fox and his matching die are from Clearly Besotted, as is the sentiment, all stamped with Ranger Java Bean dye ink. The cloud embossing is from Stampin' Up and the tree from MFT. The panels were cut with Simon Says Stamp stitched squares and rectangles. I've just googled penguins and legs and apparently they do have very short ones! I die cut a circle from white cardstock and trimmed off the edges so it would sit in the corner, and then stamped the sentiment from Clearly Besotted's 'Be Merry' set. The sentiment was masked before spreading embossing paste through a Tim Holtz 'Speckles' stencil. 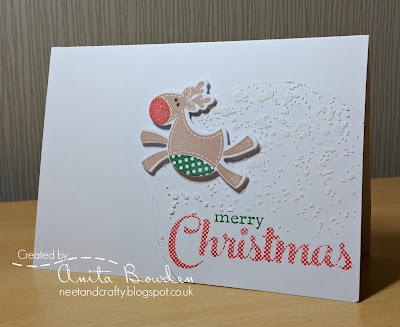 The reindeer was stamped and die cut using Clearly Besotted's 'In Stitches - Christmas' stamp and die set, then popped up on 3D foam. It looks like Christmas is coming to Less is More with the last two cards... there's nothing quite like being prepared! Please do visit the DT's personal blogs... there is always a little extra inspiration to be found there! Join us with this fun challenge and don't forget that creatures are not the only things with legs! You are most welcome and we are thrilled to have you Rebecca. Delighted to have you with us Rebecca! Fabulous inspiration as always from the DT-hello to Rebecca-love your card ! Stunning cards Ladies and a great challenge. Fun challenge and DT cards! Pjew ladies, i thought i wouldn't make it to join in this week. It's my last one since we go on holliday friday night. But my laptop is comming along and we have internet so i will be able to follow the blog. So glad i still could join in. Such great DT and GDT inspiration cards, thanks for another great card. And i have also seen there are already a lot of gorgeous entries.